I think the interior looks leaps and bounds better than the current gen. Exterior is following the same trends as the ford escape. Its ok...again better than the current imo. While there are changes here and there, it's not much of a difference to me. Dash is still too utilitarian for me. Doors look good though. These are Japanese terms we heard quoted by Toyota representatives when describing its 2013 RAV4. Apparently the 1st 1 means "go and see for yourself" and the 2nd means "heart pumping, adrenaline racing." Nice expressions, but not exactly the ones we'd choose. So we'll introduce 1 of our own: "Same same but different." The latest version of Toyota's compact crossover follows the same basic outline of models past. As ever, its on-road ride and handling are competent but not sporty, the powertrain is smooth and efficient and the price is reasonable. It's a tried-and-true formula, but over the last few years, new competitors like the Honda CR-V and Ford Escape have stolen the thunder of Toyota's original cute ute, leading the automaker to refine the mix of ingredients that go into the RAV4 in an effort to take back the compact crossover crown. Read on to see what's new. Let's talk style. As in, this Toyota has some. Much has been made of Akio Toyoda's corporate mandate that the automaker make no more boring cars, and the last few releases (most recently the redesigned Avalon) from the Japanese automaker have indeed offered more style and substance than in the last several decades. The new RAV4 is no different. 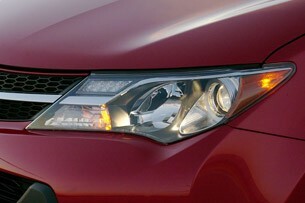 Up front, Toyota has adopted a split upper grille with attractive chrome accents that artfully extend into the headlight clusters. There are sharp creases along either side of the front fascia that, along with large fog lamps and sweeping bumper protrusion, form a distinctive face. The body sides also feature plenty of metal sculpting, and somewhat surprisingly, even though there are swage lines flowing in several different directions – downward-sloping through the roofline, upward along the window line and the lower doors and flatly horizontal through the tops of the doors – the overall look is cohesive. That stylish togetherness ends at the rear, however, with funky shelf-shaped taillamps that protrude from the body and an oversize spoiler above the rear window. 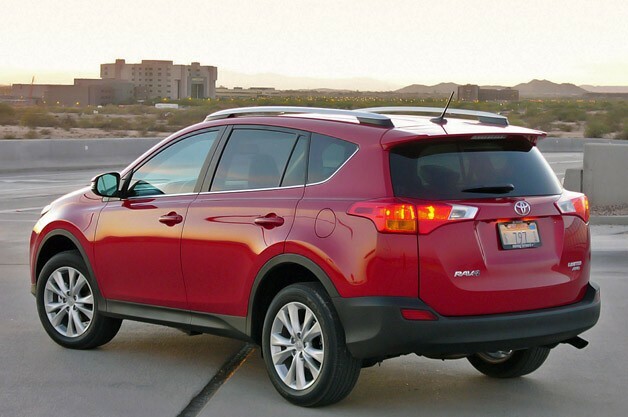 1 other noteworthy change for 2013: A regular liftgate is present instead of the swinging tailgate, a design made possible by the inclusion of an internal space-saver spare instead of the exterior-mounted units of all RAV4s past. Adding that liftgate has allowed Toyota to offer optional power assist on Limited models, featuring a memory system that allows the owner to limit the height of the gate's upward swing – useful when parking in garages where vertical space is at a premium. And unlike systems offered by other automakers, it doesn't just default to fully open and 3-quarter height positions. 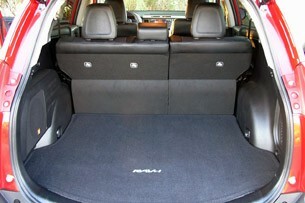 Moving the party inside, the biggest change to the 2013 Toyota RAV4 is the deletion of the optional 3rd row. We asked Toyota about the switch from 7 passengers to 5 and were told that having a 3rd row in the compact RAV4 wasn't a priority. 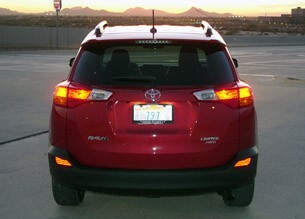 For the most part, we agree, as the way-back in the RAV4 was pretty tiny and uncomfortable for normal-size adults. In any case, there are plenty of 3-row crossovers on the market, including Toyota's own Highlander, catering to those who need more room than the compact ute has to offer. 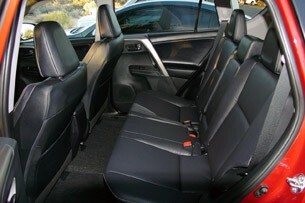 The 5 remaining seats can be covered in 2 fabric types or a synthetic leather substitute that Toyota calls Softex. After sampling all options, we definitely prefer the cloth – we find it hard to believe anyone will be fooled by the imitation leather. Sadly, opting for Limited trim necessitates the Softex interior treatment. Toyota wanted to "add to the RAV4's sportiness" by making a "driver-centric seating area." We're not so sure it was successful – though all the switchgear, LCD screens and driver touch points are within easy reach, there doesn't seem to be any specific sportiness to the overall look and feel of the cockpit. What the interior can be, though, is bold. Toyota has gone with a so-called color block concept inside the RAV4, with large swaths of contrasting materials that can be had in a somewhat jarring Terra Cotta finish on Limited models. It's more mundane in black, gray and beige, but still effective at breaking up the monotony. Materials are of average quality for this class, though there are a bunch of colors and finishes that don't really match, such as the plastic surrounding the center stack being a different metallic bronze shade than the horizontal trim running atop the dash. We also don't like the criss-cross plastic pattern used around the shifter and on the door panels front and rear. It's so hard we could file our fingernails on it. There's a bit more room inside the 2013 RAV4 for the driver than last year. Toyota has added an extra 0.8 inches of travel at the back of the seat rail, along with an additional 0.6-inch of height adjustment that allows the driver to sit lower in the car. Add those important adjustments to the taller seatback and longer seat cushion and the end result is a comfy pair of seats. Considering the deletion of the 3rd row, it's somewhat incongruous that rear-seat passengers have 1.1 fewer inches of legroom (37.2 inches) and 3.5 fewer inches of hip room (48.9) than the outgoing model. We assume moving the space-saver spare tire from the outside of the tailgate to a space under the cargo floor has something to do with this otherwise unexplainable reduction of interior space. In any case, we were still able to fit 2 occupants comfortably in the back seat even with the front chairs in adult-size positions, but not a 3rd. 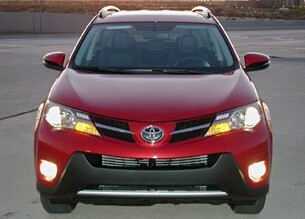 Standing outside the 2013 RAV4, it's clear that Toyota has brought its compact crossover closer to the ground. A look at the spec sheet reveals an overall height of 65.4 inches, a reduction of about an inch from 2012. Ground clearance has fallen from 7.5 inches to a sedan-like 6.3 inches, which is probably fine since the RAV4 isn't really intended to travel very far off the beaten path. Inside, headroom is down an inch (without the moonroof) with 39.8 inches available. Adding the moonroof subtracts about an inch of headroom. 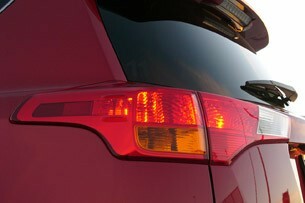 We also can't explain why the 2013 RAV4 weighs more than its predecessor. At 3,435 pounds with front-wheel drive, the 2013 model weighs 75 pounds more than the 2012. A loaded-up Limited model with all-wheel drive tips the scales at 3,610 pounds. There's 1 good bit of interior usefulness to report: Cargo volume is up to 73.4 cubic feet with the 2nd row folded, which is a best-in-class figure, and there's a reasonable 38.4 cu-ft available behind the rear seat. 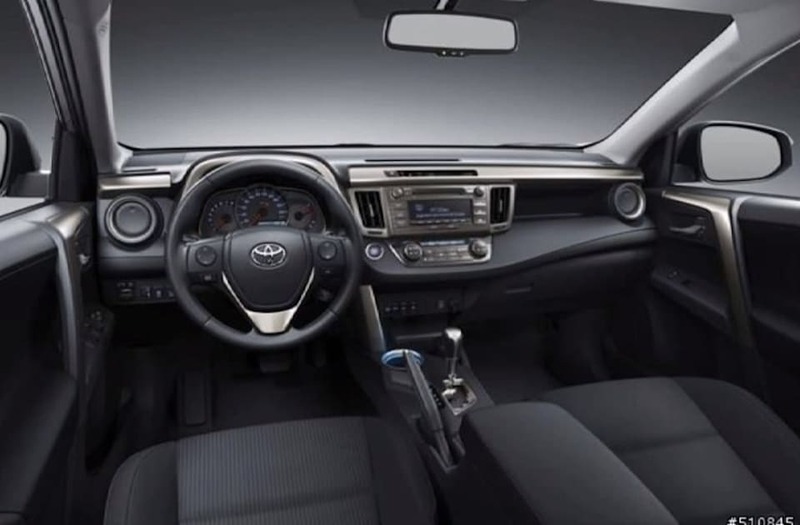 As far as technology goes, Toyota has seen fit to offer its touchscreen Display Audio system as standard equipment, along with a backup camera integrated into its 6.1-inch display. 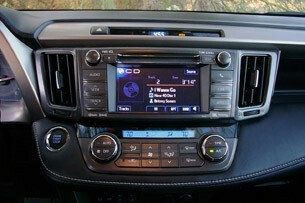 That means all 2013 RAV4s will have an auxiliary jack, a USB port, hands-free phone capability and music streaming via Bluetooth. Navigation and Entune are optionally available on XLE and Limited trim levels, and a JBL sound system with 11 GreenEdge speakers can be had on the Limited. It's a fine audio system that offers plenty of volume, which is good, since there isn't going to be a beautiful soundtrack from the engine. Stability control, traction control, anti-lock brakes, electronic brake-force distribution, brake assist and smart stop technology, each with its appropriate acronym, make up Toyota's Star Safety System, which comes standard on the 2013 RAV4. Optional on Limited models is a blind spot monitor with rear cross-traffic alert. When so equipped, the driver will be warned of oncoming vehicles when the RAV4 is in reverse. Irritatingly, desirable bits and pieces like sun visor extensions (seriously, why are these not standard? ), a smart key, heated seats and the aforementioned power liftgate come only with the Limited model, which also means accepting the fake leather Softex upholstery. LE models come equipped with 17-inch 5-spoke steel wheels with "alloy-like wide vent" wheel covers which do a surprisingly convincing job of looking like alloys at a distance. 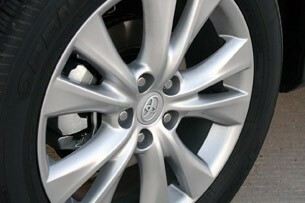 XLE and Limited models are equipped with alloy wheels in 17-inch and 18-inch sizes, respectively. Under the hood, buyers will find a 2.5-liter 4-cylinder engine offering up 176 horsepower and 172 pound-feet of torque. This engine carries over from 2012 with only a few updates designed to improve efficiency, but the big news is a move out of Ye Olden Days in the transmission department. A 6-speed automatic has finally replaced the old 4-speed unit. Hooray! With 2 extra gears comes improved fuel economy of 24 miles per gallon city, 31 highway and 26 combined with front-wheel drive or 22/29/25 with all-wheel drive, increases of 1 to 3 miles per gallon across the board. What's more, the 0-60 run now takes 8.9 seconds, a drop of well over a second from the 2012 model with the same engine, and there's much better spacing between gears on mid-speed roads. Toyota's 6-speed automatic gearbox also includes AI-SHIFT control, which attempts to deliver the kind of shift feel that the driver and road conditions dictate, and a Sport mode with Dynamic Rev Management that allows smoother and quicker shifting when activated. There's also an ECO mode that kills driver involvement at roughly the same rate as it improves fuel efficiency. We engaged it, then immediately turned it off it. 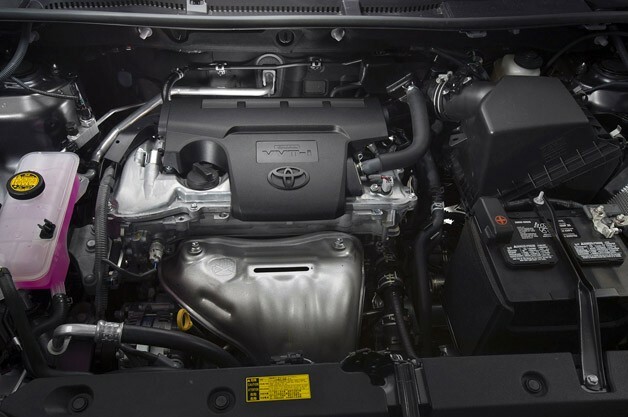 The 2013 RAV4's all-wheel-drive system is more sophisticated than before, with a computer-controlled electromagnetic coupling transferring power front to rear as required. Up to 50 percent of the engine's torque can be sent to the rear wheels, and the system can be locked at speeds under 25 miles per hour. When set to Sport mode, RAV4 models with all-wheel drive now feature all kinds of computer trickery to help reduce understeer. Adding all-wheel drive to any RAV4 model will likewise add $1,400 to the sticker price. Base LE models begin at $23,300, while mid-grade XLE trim models start at $24,290. Opting for the top-level Limited brings with it a window sticker of $27,010. Toyota expects the XLE to make up 40 percent of RAV4 sales, with the other 60 percent divided equally between LE and Limited trims. A heart-of-the-market, all-wheel-drive XLE with navigation and Entune will cost $26,720. If Toyota's calculations prove correct, about 2 -3rds of the 200,000 RAV4s it hopes to sell in 2013 will be equipped with all-wheel drive. That sales goal, by the way, would represent an increase of about 30,000 units over the sales peak in 2007 that was nearly matched in 2010 before dropping to 132,000 in 2011. Ambitious plans, it seems. On the road, we could definitely feel the high-tech AWD drivetrain helping out when the road turned twisty, actively rotating the rear of the vehicle through the corner. Enthusiast drivers take note: we suggest you test drive the all-wheel-drive RAV4 even if you don't expect to drive in adverse weather conditions, and don't forget to select Sport mode. The RAV4's suspension has received plenty of tuning adjustments, but it's still geared toward smooth running in lieu of sporty handling and road feel. Similarly, the electronic power steering delivers reasonable response and effort for a compact crossover, but don't expect to feel much feedback from the road. Fortunately, big impacts are very well damped by the moving bits below, and we'd describe overall handling as pleasantly predictable. 4-wheel disc brakes (ventilated up front) are standard, though we find it a bit odd that the LE model is fitted with smaller (10.8-inch diameter, .98-inch thickness) units than XLE and Limited models (11.7-inch and 1.1-inch). Rear brakes are the same all around, measuring 11.1 inches in diameter and .472 inches in thickness. Regardless of size disparities, we found the brakes perfectly adequate during our drive. 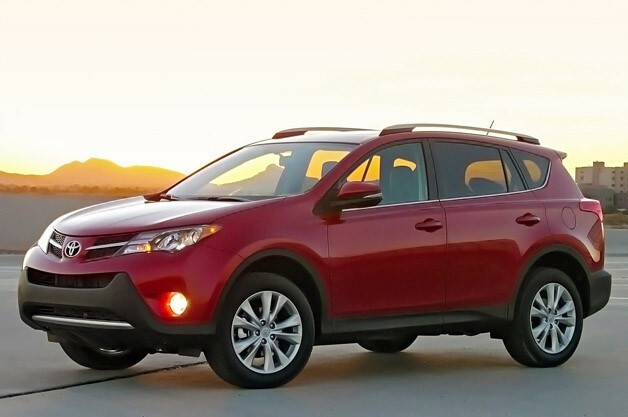 In fact, the descriptors "pleasantly predictable" and "perfectly adequate" pretty much sum up our opinion of the 2013 RAV4. Thing is, the same could be said of the 2012 RAV4 as well. We appreciate the updates Toyota has made to keep the compact crossover competitive, and we don't really mind the deletion of the V6 engine option and the seriously cramped 3rd row of the past. Whether or not Toyota's comprehensive refresh of the 2013 RAV4 is enough to put it atop the Honda CR-V and Ford Escape is another matter entirely. Whether or not Toyota's comprehensive refresh of the 2013 RAV4 is enough to put it atop the Honda CR-V and Ford Escape is another matter entirely. I don't see this making a big surge in sales unless there's a lot of cash on the hood. This, if you can contain your excitement, is the new Toyota RAV4, which will reach our shores in early 2019. Yes, we know. Be still our beating, middle-aged hearts. So, let’s start with what we see – the brand-new design. 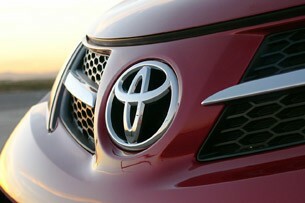 According to Toyota, the design “resonates with a target customer base of young families who enjoy life”. So, we guess you’re all out of luck if you’re a family of misanthropes. Setting aside the prose of the press release, we can glean that the new RAV is the beneficiary of a brand-new platform, which promises much improvement in many areas. It’s called the TNGA, or Toyota New Global Architecture, and it is Toyota’s new architecture for the cars that it sells globally. So, points for brevity, accuracy and literalism there. When the TNGA is combined with the RAV, one would expect to find a GNATVAR. Or perhaps a VATRANG. Instead, Toyota insists that it’s still a RAV, and one that has a 30mm-longer wheelbase for much interior spaciousness, as well as a whole extra centimetre of width, to encompass the massive gains you’ve been getting at the gym. Also, the front and rear overhangs are shorter, which is sure to impress the zero per cent of people who take these things off-road. To ensure some semblance of consumer advice in this article, we consulted TG’s resident family man, who says that the new RAV is “less ugly than the old one,” thanks to “a bit of Lexus RX-ish angular surfacing”. And we’re inclined to agree – it is rather angular and Lexus-ish, in the style that Toyota seems to be pursuing at the moment. Inside, it’s much more standard fare; there’s an air of restrained sensibility, much like all Toyotas, that eschews the Kevin McCloud-worthy interior ambiance of Audis for exceptional simplicity. You could also accuse it of being staid and stolid to the point of incomparable boringness. But we’ll leave you to make your own mind. Getting on to the oily bits, and we find that the TNGA initialism has found its way into engines as well, and again promises much improvement in many areas. Both the 2.5-litre hybrid and 2.0-litre unassisted petrol powertrains are apparently more powerful and efficient than the current ones, but the exact percentages we’re sure you’ve been sweating over are unavailable as of yet. Toyota is at the stage of mucking around with ideal stroke-to-bore ratios and other exceptionally geeky things, so expect incremental improvements rather than night-and-day leaps. It looks alright in these pics but in all other pics I seen of it, it looked absolutely awful. It looked like 4 separate designers designed 4 different parts and then they stitched it together. Still not a fan of infotainment screens that stick out of the dash, and that one is pretty extreme. IMO, has a really strong Scion tC resemblance in the front. Overall not bad though. If I were in the market though, CX-5 or CR-V would probably slot above this one. The all-new, fifth-generation Toyota RAV4 is looking ahead with the unveiling of the 2020 RAV4 TRD Off-Road model at the 2019 Chicago Auto Show. Arriving in the fall of 2019, the newest addition to the RAV4 family will be outfitted with a full array of special Toyota Racing Development engineering and design features for greater trail-driving capability and standout style. For the first time, the RAV4 will join a formidable team of Toyota TRD Off-Road SUVs and pickups inspired by the brand's legendary off-road and desert racers. Beneath the new-generation RAV4's bolder design, the Toyota New Global Architecture (TNGA-K) platform provides an ideal base for TRD's renowned go-anywhere capability and style. Building on the 8.6-inch ground clearance and design features of the RAV4 Adventure grade, the 2020 Toyota RAV4 TRD Off-Road goes above and beyond with suspension, wheels and tires engineered specifically for trail driving. Standard Dynamic Torque Vectoring All-Wheel Drive can direct up to 50 percent of engine torque to the rear wheels, as well as distribute torque to the left or right rear wheel to enhance handling on or off pavement. When AWD isn't needed, such as on long highway stretches, Rear Driveline Disconnect optimizes fuel economy. Using standard Multi-Terrain Select, the driver can maximize traction by matching the drive mode to the conditions -- Mud & Sand mode for beach driving, or Rock & Dirt mode for trails, and Snow for wintery conditions, for example. 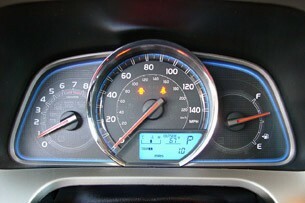 The Multi-Information Display (MID) shows torque allocation and slip control data. The new-generation RAV4's short front and rear overhangs enhance trail-driving capability. In addition, the Toyota RAV4 TRD Off-Road will include Hill Start Assist Control (HAC), Trailer Sway Control (TSC), and Downhill Assist Control (DAC) for optimal on-road and off-road performance and safety. The 2020 RAV4 TRD Off-Road takes cues from Toyota's rich off-road racing history. It shares high-rise roof rails, large over-fenders, and aggressive bumper, grille designs and fog light surrounds with the RAV4 Adventure grade, but with a uniquely TRD personality. Inspired by TRD's successful learnings with Ryan Millen's Rally RAV4, TRD Off-Road suspension is engineered to enhance body control and small-bump isolation to help smooth out trails and rough city streets. Unique red coil springs are tuned for an off-road focus. The twin-tube shocks are re-valved and feature new internal rebound springs to improve rebound control. New bump stops maximize compression direction wheel travel and help improve body control over large bumps and dips. The 2020 Toyota RAV4 TRD Off-Road exclusively rolls on lighter and more rigid flow-formed 18x7-inch matte black TRD alloy wheels with Falken Wildpeak A/T Trail all-terrain tires. These all-terrain tires mean business, with a unique tread pattern and compound developed to TRD technical requirements. A rugged square shoulder design helps protect against punctures, on or off road, and the tires are Severe Snow Rated with open shoulder grooving to shed debris, mud and snow. Available in an exclusive two-tone Magnetic Gray Metallic w/Ice Edge Roof combination, the Toyota RAV4 TRD Off-Road is accented by dark gray front and rear lower fascias, and front LED fog lights are standard. TRD Off-Road is also available in Midnight Black or Lunar Rock, both of which are available with optional Ice Edge Roof. Other available colors include Ruby Flare Pearl and Super White. Inside, striking red stitching and red trim accent the cabin. 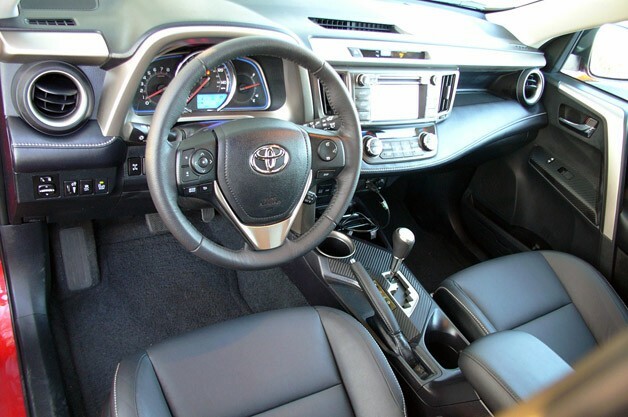 Seat surfaces are covered in comfortable SofTex, which is lighter than leather yet highly durable, and the front seats have "TRD" stitched into the headrests. Exclusive TRD all-weather floor mats and rear cargo mat capture the mud, sand and water dragged in from the outside and easily shake out for cleanup. That actually looks pretty cool. Like a baby 4Runner.